The countries in India's neighbourhood are no less exotic. 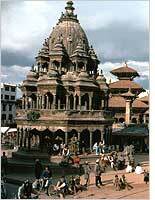 Countries like Nepal, Bhutan and Tibet hold a great deal of tourist attractions to explore. Nepal offers one a mix of places of worship and adventure destinations whereas Tibet charms visitors with its incredible people and their lifestyle. The Kingdom of Bhutan offers an aura of mystique for visitors to soak up. Once you have seen and experienced the spots, you will keep coming back for more and more.. and more!